This beef curry reminded me of both Indonesian and Thai curries without being identical to either. It was very good, complex without being spicy. The meat was unfortunately not very tender, but I imagine I just used the wrong cut. It was not too complicated to make, but finding the ingredients for the spice mix required quite a bit of time. I finally found the kaffir lime leaf and the galangal at a Thai market (the latter is also available at the Berkeley Bowl) and the candlenuts at the 99Ranch supermarket. I didn't have the palm sugar so I substituted with brown sugar and molasses. I also substituted the distilled white vinegar with white wine vinegar as I had ran out of the former. I made some changes to the recipe as well, as the original one called for lamb. Now lamb uses a different spice mix than beef does in Balinese cuisine, so instead of using the "basic spice mix" the recipe called for, I used the "spice mix for beef". I used a little bit more beef than the recipe called for, but it worked well enough. Finally, I kind of invented its Balinese (or is it Indonesian?) name. 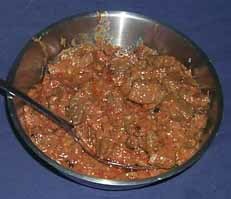 It's original name was Kambing Mekuah which was translated into Balinese Lamb. I figured out that kambing was either goat or lamb and that sampi is beef. I'm not sure what be means, but many beef and pork dishes seem to start with that word. I still don't know what mekuah means either but I'm pretty sure it does not mean Balinese. I thought at first that it might mean "coconut sauce" but then I found several recipes that had that name but did not call for any coconut milk. I now think that it means something like curry. I really liked this dish but I'm not sure if it's worth all the effort. Still, if you do want to make a Balinese dinner this is sure to please your guests. Make the spice mix by combining all spice mix ingredients, save for the oil and the lime leaf, and grinding them coarsely in a good processor. Heat oil in a heavy saucepan. Add the spice mix and the lime leaf and cook over medium heat until golden, about 5 minutes. Set aside to cool. Boil 12 cups (3 liters) of water in a large pot. Salt & pepper the beef cubes. Add the beef cubes and cook for 5 minutes. Pour out the water. Heat the oil over medium heat in a saucepan and add the spice mix and coriander seeds. Fry for 2 minutes. Add the beef cubes, vinegar, cardamon, lemon grass and water. Bring to a boil, lower the heat and simmer until it's almost cooked through. Add the coconut milk, bring to a boil and simmer uncovered until the meat is tender.